Trump's SOTU speech was wonderful, factual and optimistic. It was a celebration of America and the successes of the last two years. 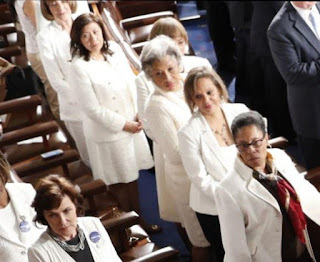 No one would know it by the visible response of the ladies in white (allegedly an homage to women's suffrage), the mostly newly elected Democrat congresswomen. The only part of the speech they sincerely applauded was themselves – more women in Congress. For most of the rest of the speech, they sat on their hands, looking mad (Mazie Hirono), glum (all of them), petulant and dismissive (Kamala Harris), bored and studiously disinterested (Nancy Pelosi). Pelosi (along with Schumer, the rudest person in Congress ever), seemed to be masticating something throughout the entire speech. Her bizarre mouth movements are as annoying as they are distracting. These angry women could not have better demonstrated who and what the Democrat Party is today. As many have observed, this is not the party of JFK. It is the party of Lenin, Stalin, and Hitler. Those women could not even stand to oppose late-term, post-birth abortion. As Planned Parenthood has been for years, these Democrat women are now in Hitler territory. Next they will be supporting the euthanasia of the elderly. Obamacare tried to do exactly that. That is the slippery slope they have willingly created for themselves. Trump's speech forced them to reveal their callous, murderous agenda for all to see. It was a pathetic, un-American spectacle, those women. In the end, they are about one thing, one thing only: rage. Rage at whom and what? Congress is being taken over by the Anarchist Bullying Democrats and the US citizens are allowing it because they don't care. All they want id "free" everything. They are allowing the millionaires, 1%ers, to make the rest of us poor living homeless. Yesterday the post was about how now wore a flag pin on their white KKK costumes. Some low information clown said "perhaps" they didn't have to wear the flag to prove their patriotism. It was pointed out that they did only clap for themselves. They didn't even clap when the President talked about the lowest on record unemployment rate for minorities. This because they are democrats and that equals the KKK. They are very very angry that blacks might get ahead and be able to support themselves without government help. Many more may actually become independent of government handout. This makes democrats so angry. They want nothing more but to keep blacks chained up and slaves to the democrat plantation. The white was appropriate. It's their real goal. To keep blacks in chains and dependent. Anyone who doesn't think so is nothing but a fool. Fine day in America. We have attorneys, bartenders, and sluts making policy, or trying to. All of them pro abortion is all they care about. So much for giving woman POWER. They abuse it. These are the murders of FULL TERM BABIES. Isn't the woman movement wonderful?? My mother always said. When you see a woman in charge. The ship is already beyond repair. Nancy needs to get that dental problem fixed. Photos show that she's been sucking at it for years. Looks like a Klan meeting. The only they’re missing is the hoods. Saw on Twitter many artists took care of their deficiency. They won't last long ...we voters have their number !!! As a career women from a poor coal Mining town in Penna this saddens me. Women have always been a important part of America. It is nothing new. If you had the will you made it. Women took over a man's job making airplanes etc when our soldiers were of to war. I have made a success career because I wanted it. These women in Congress wearing white to support women's suffrage is a joke. They want to murder babies, take your money, your health and whatever they can. Let's put a stop to these pampered women who done have a clue what life is all about. I hope they all only get 1 term and never should have gotten that. 'PELOSI'S PUPPETS" She tell them when to stand up, shut up and sit. They are scared of her bullying because she will make them pay if they do not obey. They are not serving their party well by acting like sour pusses. In fact, more Dems are leaving the party everyday because of their shenanigans. Angry liberated women of the worst kind. wondr if any of them are married and what kind of ballless man would put up this their bs? maybe that's why they are so angry! bunch of carpet munchers?